It's Facebook Fridays! for January 6, 2017! It's the time of the year for travel, and we want to make sure that you arrive safely at all your destinations. 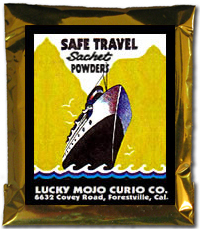 The Lucky Mojo Curio Company is holding a random drawing to give away 3 Safe Travel combo packs, each containing a bottle of hand-made Lucky Mojo brand Safe Travel Anointing Oil, plus one foil packet each of Safe Travel Bath Crystals, Safe Travel Incense Powders, and Safe Travel Sachet Powders. Use these traditional rootwork supplies to spiritually fix your vehicles, suffumigate your luggage, and dress the soles of your shoes so that wherever you go, your journeys will be easy, no harm will befall you, and you will find friends, companions, and helpers to assist along the way. 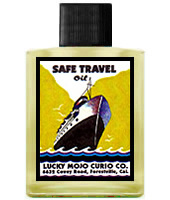 First thing tomorrow morning, we will select THREE winners at random, and ask them to message this Facebook Page with their mailing addresses, so we can send them their FREE Safe Travel products. Thanks for posting this, Ernie -- and let us see how many folks get on over to the Lucky Mojo Curio Co Facebook page and enter the contest. There are usually HUNDREDS of entrants, but since we hold these giveaways every sngle week, you will always hve a chance to win if you enter every time. We have a winner! In fact, we have 3 lucky winners! Our Facebook Fridays! winners for January 6, 2017 are: Eugene Fritz, Amanda Dery, and Raleigh Bryant III. Thanks very much to all of you for participating. Watch this space for a new giveaway next Friday!